The species most commonly identified called a false widow, Steadota nobilis is identified by a number of features such as dark brown glossy legs and carapace along with a bulbous abdomen. 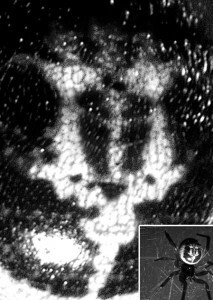 But perhaps the most sinister feature of this spider is the pattern on the upperside of its abdomen which some people describe as looking like a skull. I have to say I’ve seen some photos of false widow spiders where the pattern is slightly more pronounced than this one but I think you can make out the eyes and nose. That said there seems to be a bit of a thing for seeing skulls in animal markings. You decide for yourself. If you believe everything you read then it probably seems reasonable that these spiders have been sent by the devil himself!